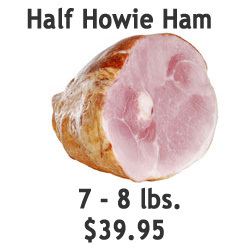 Howard & Sons proudly introduces the "Howie Ham". 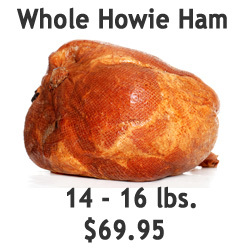 If you would like to purchase a premium holiday ham, please click on the product below. You will then be prompted to choose your organization and pickup location. On the checkout page, please enter your shipping address and choose the in store pickup option. Pickup dates are listed below for the Howard and Sons store. Please refer to your organization if you will be picking up your purchase at their establishment. This an excellent way to support your local school or organization. Thank you in advance for your contribution. If you will be picking up your ham at the Howard and Sons Store location, pickup dates will be 12/17 - 12/24, anytime. *** Is your school/organization already involved? Please login to your account to track your sales.